Items of a personal nature, e.g., laundry, gifts, etc. 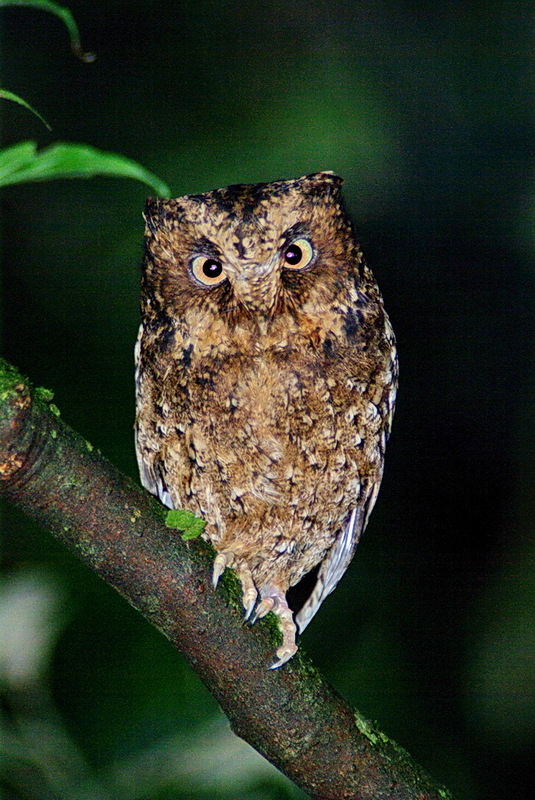 Borneo, the world’s third largest island, is one of the world’s most bio-diverse wildlife havens. 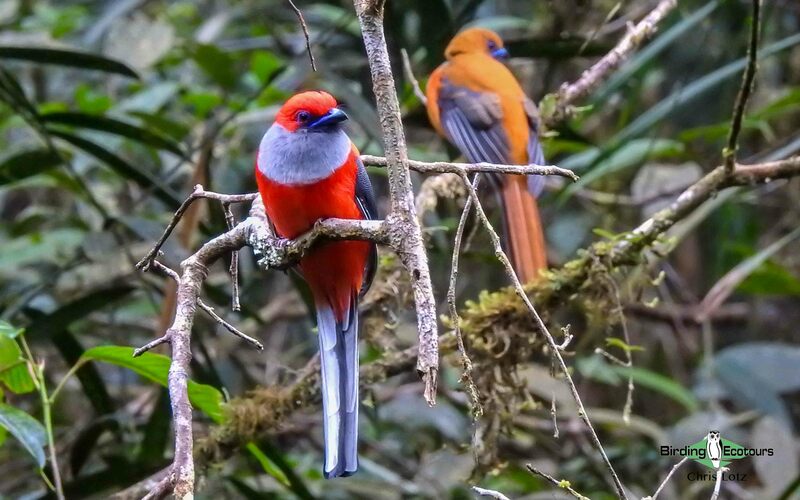 With over 50 island endemics and pristine Dipterocarp forests, montane cloudforests, riverine habitats, and mangrove swamps, you should enjoy an amazing trip filled with stunning birds like pittas, trogons, kingfishers and broadbills, as well as many mammalian treasures like Bornean Orangutan, Proboscis Monkey, Crab-eating and Southern Pig-tailed Macaques, Malay Civet, Red Giant Flying Squirrel, and an array of other squirrels including the world’s smallest species, along with a great many reptiles, butterflies, etc. 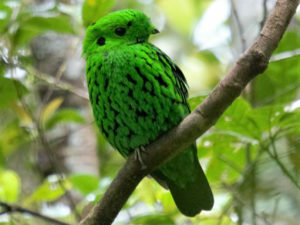 Our tour will bring us to most of the important birding venues of the Malaysian province of Sabah, which covers the northernmost part of this vast and amazing island, including five of its IBAs (Important Bird Areas identified by BirdLife International): the Crocker Range, Mount Kinabalu, Kabili-Sepilok, the Kinabatangan floodplain, and the Danum Valley. 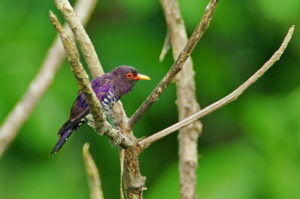 Some of the many birds we target are the famous “Whitehead’s Trio”, the Trogon, the Broadbill, and the Spiderhunter, Bornean Bristlehead, Bornean Ground Cuckoo, all four endemic pittas (along with Hooded Pitta), all eight hornbill species including ones that are over a meter (three feet) long, and a plethora of others. Please note that this is a relatively premium trip but at a very fair price. The overall cost is quite low because it is slightly shorter than most Sabah birding/wildlife tours, but the daily cost is on the higher side of average compared to that of competitors, because we use superior accommodation and a superior local guide and other ground staff. We don’t cut corners, because we like to support long-term conservation, which means not cutting out local staff members. 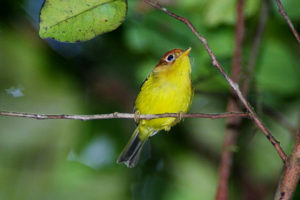 This tour can be combined with our preceding Birding Tour Borneo: Sarawak Pre-tour 2020 and/or our following Birding Tour Malaysia: Peninsular Malaysia 2020 tour. Your international flight arrives any time in the morning and you will be transferred to your hotel. Then we meet for lunch at the hotel lobby at 1 p.m. and we can start birding at 2 p.m. We can go birding around the Tanjung Aru beach to look for Blue-naped Parrot, Pied Triller, and other birds that we won’t encounter for the rest of the trip. 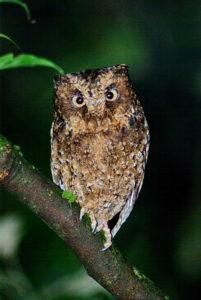 Early morning (usually around 5 a.m.) we will take a packed breakfast and transfer to Kinabalu National Park, a UNESCO World Heritage Site. En route we will stop at the Tambunan Rafflesia Centre and Gunung Alap in the Crocker Range. Here we will be birding for the whole morning, hoping to see, among others, a number of Bornean endemics such as Whitehead’s Spiderhunter, Bornean, Mountain, and Golden-naped Barbets, Bornean Treepie, Chestnut-crested Yuhina, Bare-headed Laughingthrush, and Bornean Bulbul, as well as Ochraceous, Cinereous, and Flavescent Bulbuls (the Bornean subspecies of the latter is known as Pale-faced Bulbul), Chestnut-capped Laughingthrush, and Blyth’s Shrike-babbler. From here we’ll make our way into the mountains to Kinabalu National Park. We will be based for three nights in Kundasang, a small village very close to the entrance to the park. 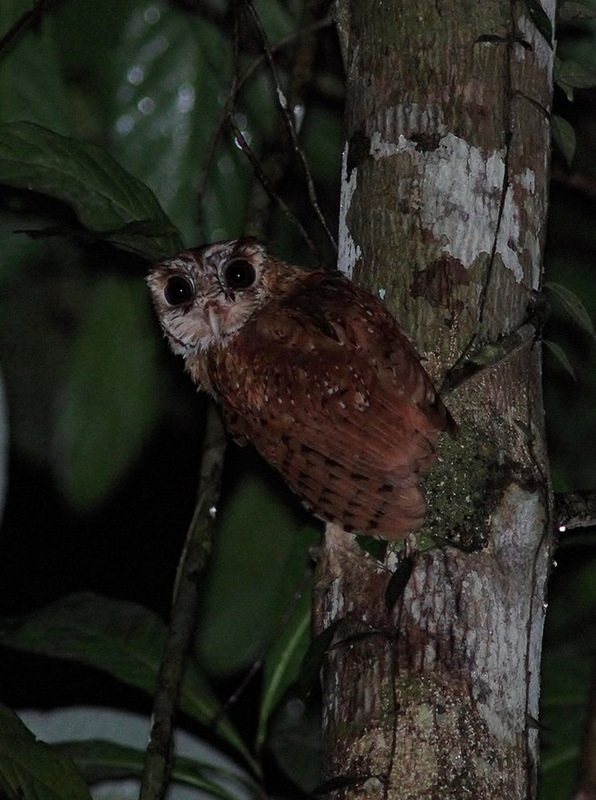 Today we will explore the network of forested trails around the headquarters of Kinabalu National Park on the forest-draped slopes of Mount Kinabalu. 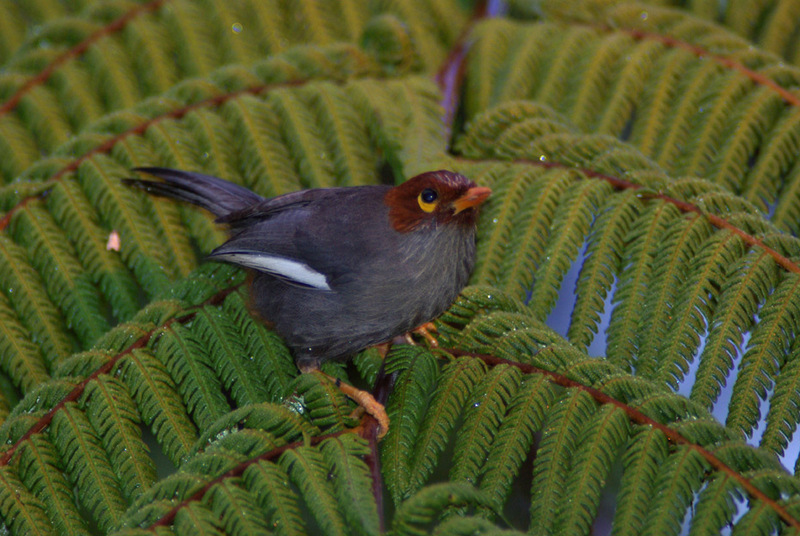 This mountain is the highest peak between the Himalayas and the tall ranges of New Guinea. 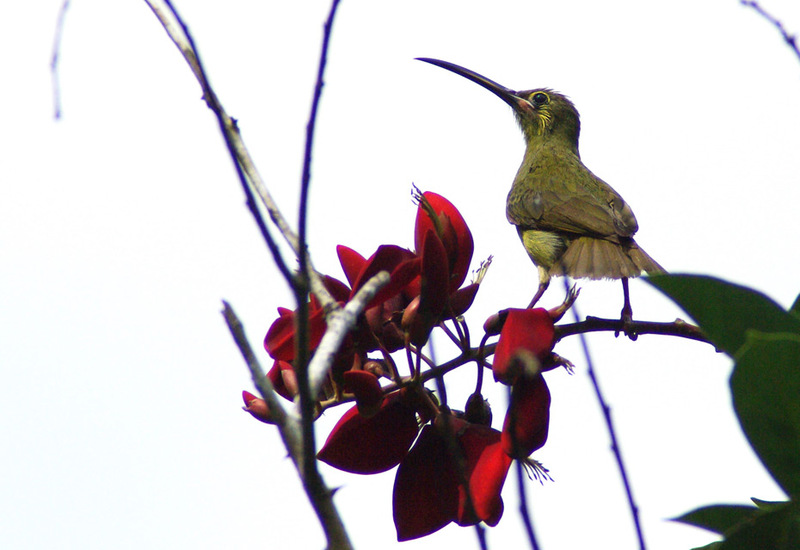 Its huge granite massif holds a spectacular avifauna, with plenty of endemics for us to enjoy. Among these we hope to find Whitehead’s Trogon, Whitehead’s Broadbill, Fruithunter, Golden-naped Barbet, Crimson-headed and Red-breasted Partridges, Bornean Swiftlet, Bornean Treepie, Bornean Stubtail, Bornean Green Magpie, Bornean Forktail, Eye-browed Jungle Flycatcher, Black-sided Flowerpecker, Bare-headed Laughingthrush, Mountain Wren-Babbler, Bornean Whistler, Chestnut-crested Yuhina, and Everett’s Thrush. 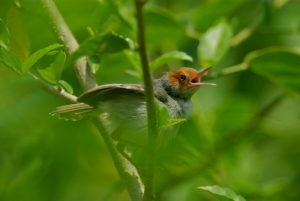 But certainly we will also be on the lookout for other enticing species, some perhaps even found in mixed feeding flocks, like Ochraceous and Cinereous Bulbuls, Chestnut-capped and Sunda Laughingthrushes, Blyth’s Shrike-babbler, Mountain Leaf Warbler, Yellow-breasted Warbler, Sunda Bush Warbler, White-throated Fantail, Temminck’s Sunbird, and Black-and-crimson Oriole, to name just a few. 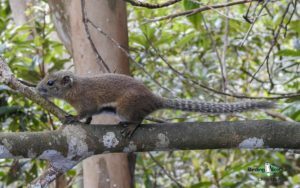 The large mammal fauna is poor on Mount Kinabalu, but there is a delightful host of squirrels and tree shrews to look for. 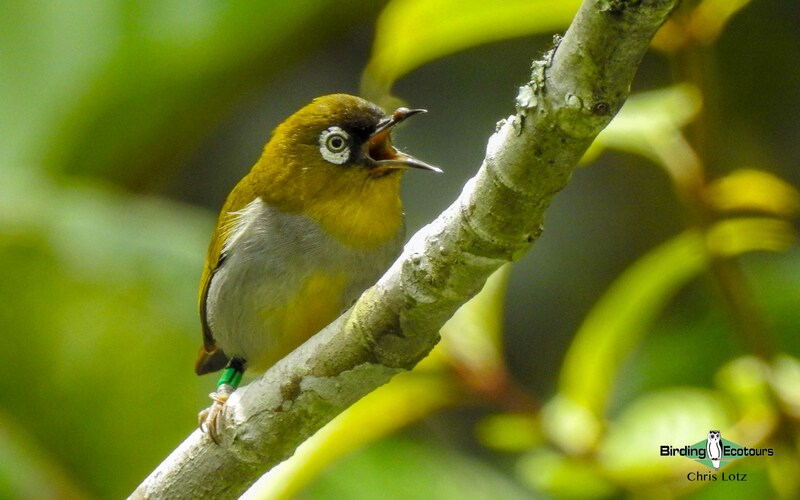 This morning we will still remain in the park headquarters for some other bird species, such as the endemic Bornean Forktail and “Pale-faced Bulbul” and the more widespread White-browed Shortwing. 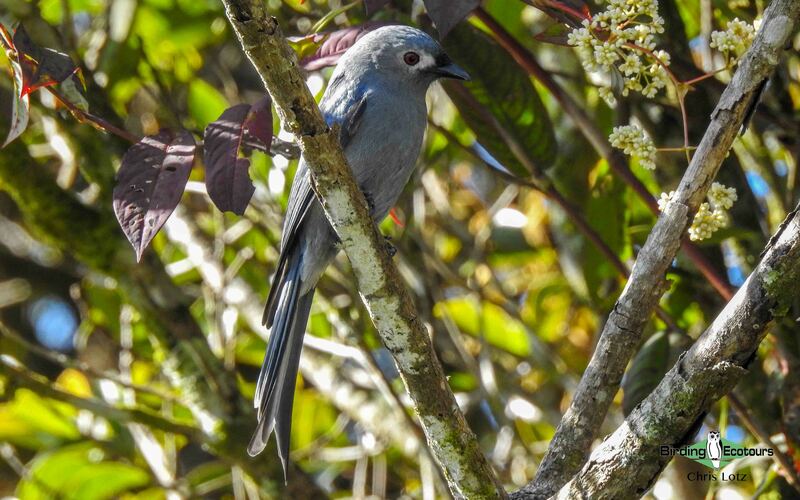 We will also again be on the lookout for Mountain Black-eye, Pygmy White-eye, Fruithunter, Cinereous Bulbul, Bornean Treepie, Bornean Stubtail, Bornean Whistler, Chestnut-capped Laughingthrush, Whitehead’s Trogon, Whitehead’s Broadbill, and Mountain Wren-Babbler. 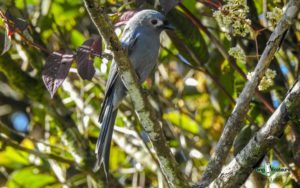 In the afternoon we will once more be birding around the Kinabalu National Park headquarters, looking for anything that we might have missed yesterday. Although in the afternoon today we will have a lengthy drive, we will spend a good part of the morning birding at Poring Hot Springs, a small reserve approximately 40 km from Kinabalu National Park. 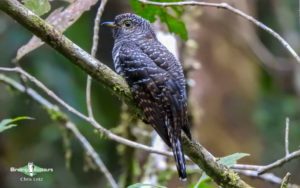 Poring is mainly known for its hot springs, which are a major Bornean tourist attraction, but the reserve also holds a number of exciting birds. 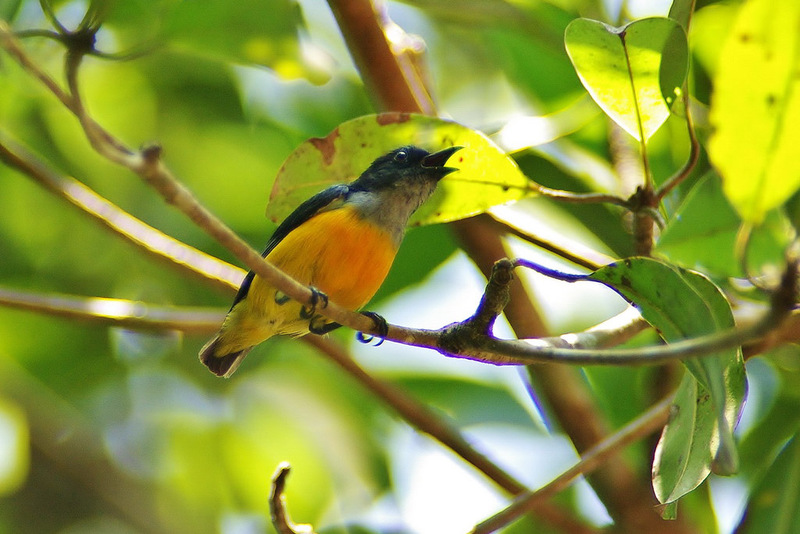 During our walk we might encounter Moustached Babbler, Diard’s Trogon, Black Hornbill, Red-throated Barbet, Plain Sunbird, Little Spiderhunter, Bornean Blue Flycatcher, Maroon-breasted Philentoma, Black-naped Monarch, and perhaps also the attractive Scaly-breasted Bulbul. 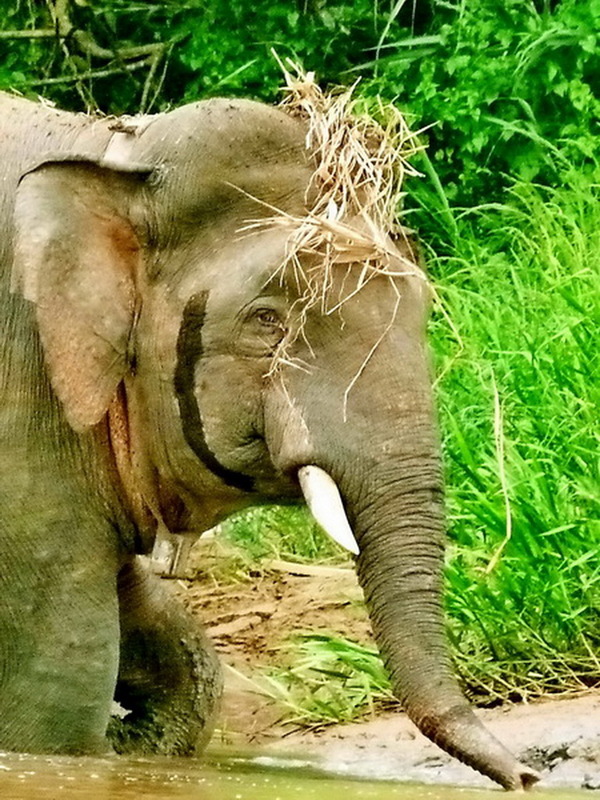 During the afternoon we will drive approximately five to six hours overland, mainly through endless oil palm plantations, to Sepilok and check into our accommodation. In the evening there will be a night walk in search of birds, mammals, and other nocturnal creatures. We’ll have a full day to explore the area. 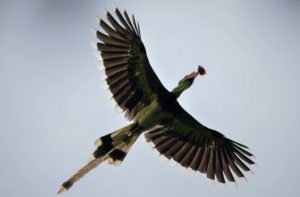 We will bird the 43 km2 of the wonderful Dipterocarp forest of the Kabili-Sepilok Forest Reserve with its magnificent walkway at the Rainforest Discovery Centre in the morning, when the birds are most active. 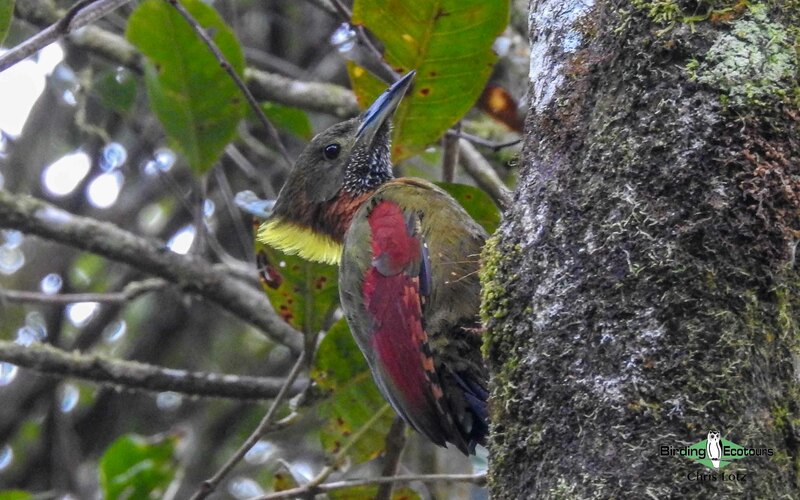 This will give us a chance for Bornean Bristlehead among many other species we are going to encounter here, like Red-naped and Scarlet-rumped Trogons, Black-capped Babbler, Black-crowned Pitta, Red-bearded Bee-eater, Oriental Dwarf and Rufous-collared Kingfishers, Little, Streaky-breasted, and possibly even Thick-billed, Spectacled, Yellow-eared, and Long-billed Spiderhunters, the endemic Yellow-rumped Flowerpecker, and Dusky Munia, as well as barbets, mid-canopy bulbuls, ground-dwelling babblers, cuckoos, minivets, and many more avian riches that can be found in these wonderfully birdy forests. 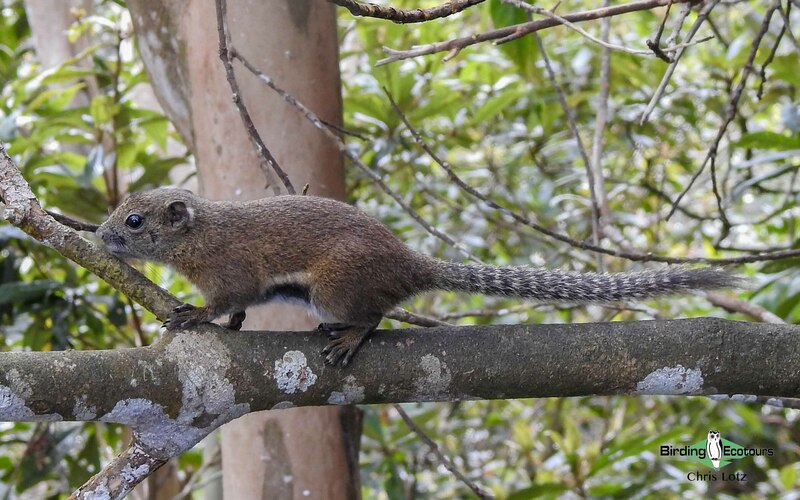 Here we might also see a number of inquisitive squirrels and possibly some primate species, among which the endearing Maroon Leaf Monkey might be particularly appreciated. An optional visit to the famous Sepilok Orangutan Rehabilitation Centre for either the morning or the afternoon feeding of these semi-wild primates, along with several other species that take advantage of the free handouts, can be arranged, although it is very likely, but of course not guaranteed, that we will see Bornean Orangutan in the wild. 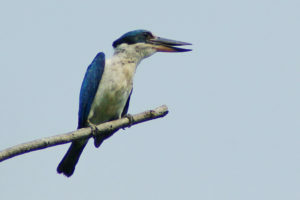 After breakfast we will still have time to do some morning birding in Sepilok for any species we might have missed. Then we will drive two hours overland, transferring to Sukau on the Kinabatangan River. We will make a stop at the famous Gomantong Caves, an intricate cave system inside Gomantong Hill, the largest limestone outcrop in the Lower Kinabatangan area. 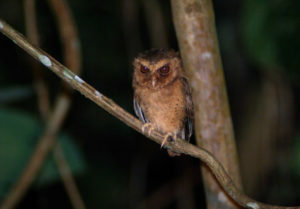 The caves and the surrounding area are a protected area for wildlife, especially Bornean Orangutans, which are frequently seen at the entrance to the caves, and are well-known in birding circles for the variety of swiftlets inhabiting them, together with a vast array of other wildlife, including massive populations of cockroaches and bats. Here we have a chance to see four species of swiftlets, which are really only safely told apart by their nests: Edible-nest, Black-nest, Mossy-nest, and Glossy Swiftlets all nest in these caves. There is a boardwalk through the caves that will give us access to the inside of the cave system, where we’ll be able to see where these birds make their nests and how the local workers collect them for birds-nest soup on intricate rope-and-ladder systems. 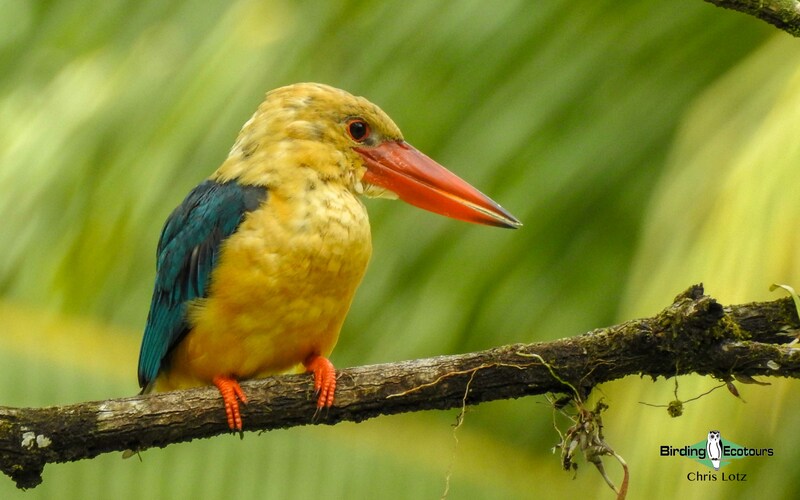 After arrival and check-in at the lovely Borneo Nature Lodge on the Kinabatangan River, where we will stay for two nights, we will embark in the late afternoon on our first birding river cruise. Some of our main targets on the Kinabatangan River are the endemic Bornean subspecies of Black Magpie, a slate of glittering Kingfishers including Collared, Rufous-collared, Ruddy, Stork-billed, Banded, Blue-eared, and Blue-banded, Red-naped and Scarlet-rumped Trogons, and Hooded Pitta. 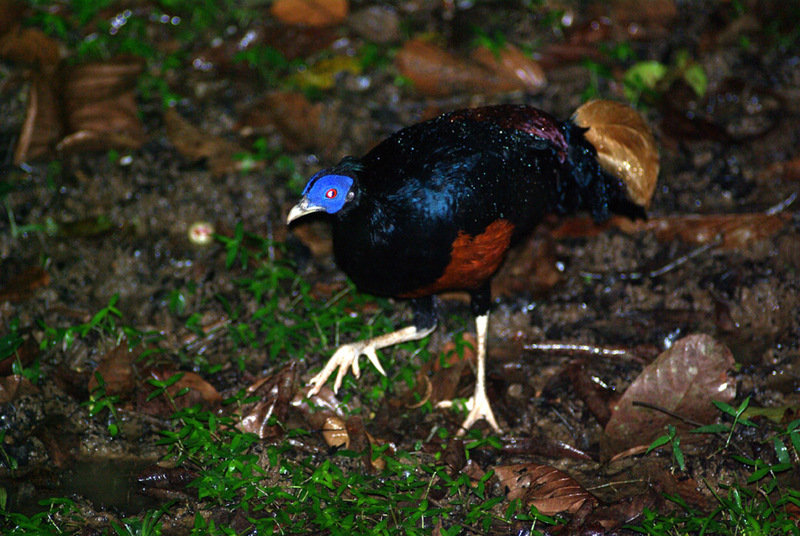 If we are very lucky we will also find our mega target, the enigmatic, rare, and endemic Bornean Ground Cuckoo. The Kinabatangan Wildlife Sanctuary is now under the purview of the Sabah Wildlife Department. 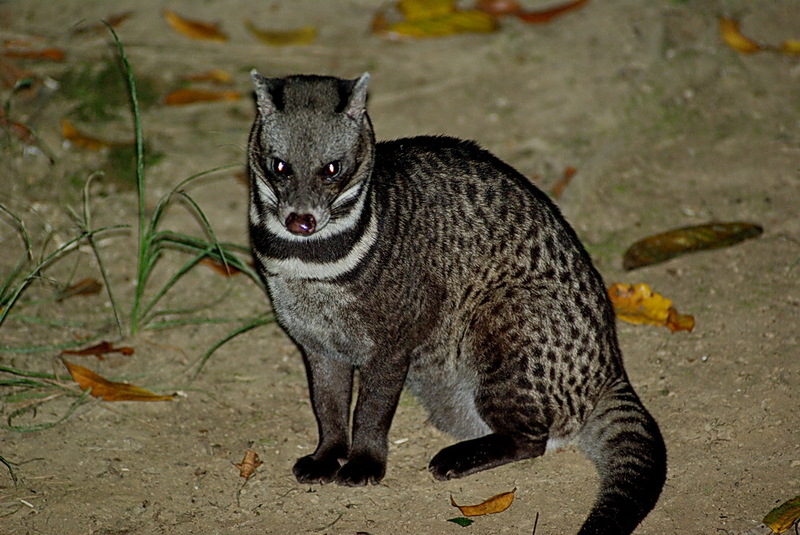 Despite ever-encroaching oil palm plantations the original lowland forests and mangrove swamps near the coast have largely survived, providing sanctuary for a population of Saltwater Crocodiles and containing some of Borneo’s highest concentrations of wildlife. 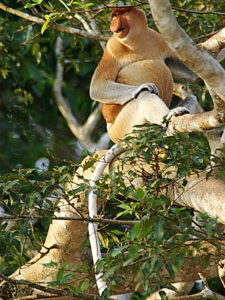 Of special note are Borneo’s indigenous Proboscis Monkey, Bornean Orangutan, Asian Elephant (possibly a full species in its own right), and the endemic Borneo River Shark. 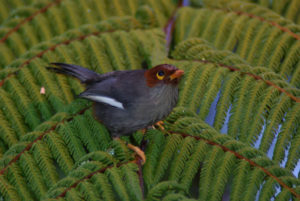 The sanctuary is also known for its prolific birdlife. We will explore this riveting area for two days. In the early morning and mid-afternoon boat trips will take us along the river and its small tributaries. Here we hope to see wild Bornean Orangutans feasting on the fruits of riverside fig trees or, in the late afternoon, preparing their night-time nests. Troops of the bizarre Proboscis Monkeys with their huge pot bellies and the males’ extraordinary, floppy noses will watch us curiously. 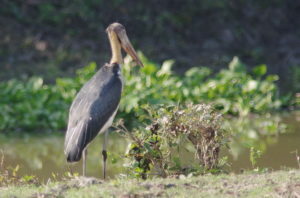 Many groups of Crab-eating Macaques will be our constant companions, and we might find the occasional Silvery Lutung (langur) and, with luck, perhaps a Bornean Gibbon. 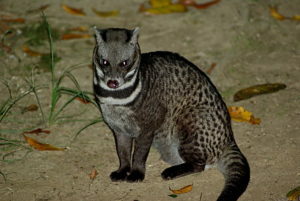 We might even come across a herd of “Bornean Pygmy Elephants” in this area or the secretive and rare Flat-headed Cat. 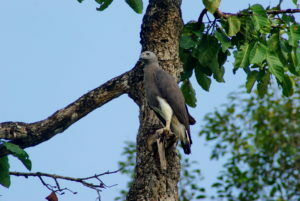 The forest along the river and its tributaries is home to a wealth of birds, including such spectacular species as Rhinoceros, Helmeted, Black, Oriental Pied, Bushy-crested, Wreathed, White-crowned, and Wrinkled Hornbills, White-bellied Sea Eagle, Lesser and Grey-headed Fish Eagles, Wallace’s Hawk-Eagle, Lesser Adjutant, Black-and-Red and Black-and-yellow Broadbills, Hooded Pitta, and with luck a pair or two of the endangered Storm’s Stork or a White-fronted Falconet sitting on a snag. 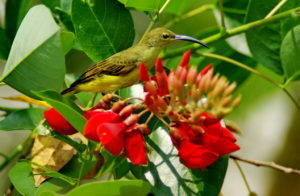 Watching smaller birds from the boat is not really easy, but the lodge grounds are very birdy, and the lodge has an extensive boardwalk system and an observation tower for bird watching. Between boat trips we will explore these areas, hoping to find the delightful Black-crowned Pitta, Asian Red-eyed Bulbul, Violet Cuckoo, the endemic White-crowned Shama, Chestnut-winged Babbler, Blue-throated Bee-eater, Dark-necked Tailorbird, Maroon-breasted Philentoma, and Orange-bellied Flowerpecker. In the evening we might see Brown Wood Owl or a Buffy Fish Owl at the jetty. After a morning cruise to look for our wanted birds we will depart overland to Danum Valley and make a stop at Lahad Datu for lunch (two hours overland). 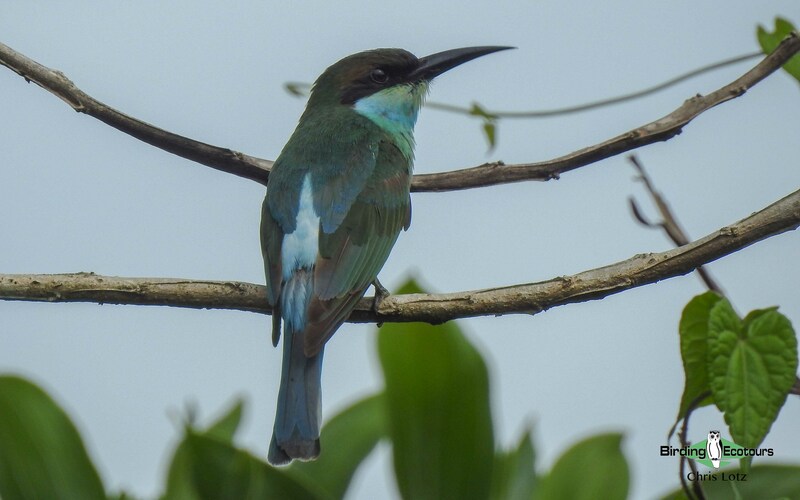 After lunch we will have another 2.5-hour drive on an adventurous prior logging road to the Danum Valley Conservation Area and the Borneo Rainforest Lodge. 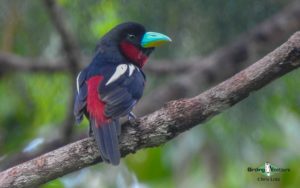 This wonderful, upscale lodge is situated in a large tract of mind-blowing primary rainforest, one of only very few remaining on Borneo after rampant logging and clearing for oil palm plantations. While within much of the conservation area selective logging was allowed, a large part had been set aside for the protection of one of only two remaining expanses of primary lowland dipterocarp forest in Sabah. 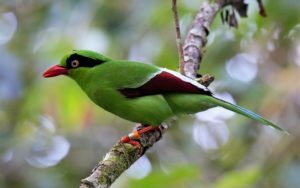 The Danum Valley Conservation Area boasts 268 bird species, and 110 mammals, 72 reptiles, 56 amphibians, and 37 fish species have been recorded here so far. We will search for a good selection of especially the birds and mammals during our time in this great habitat. 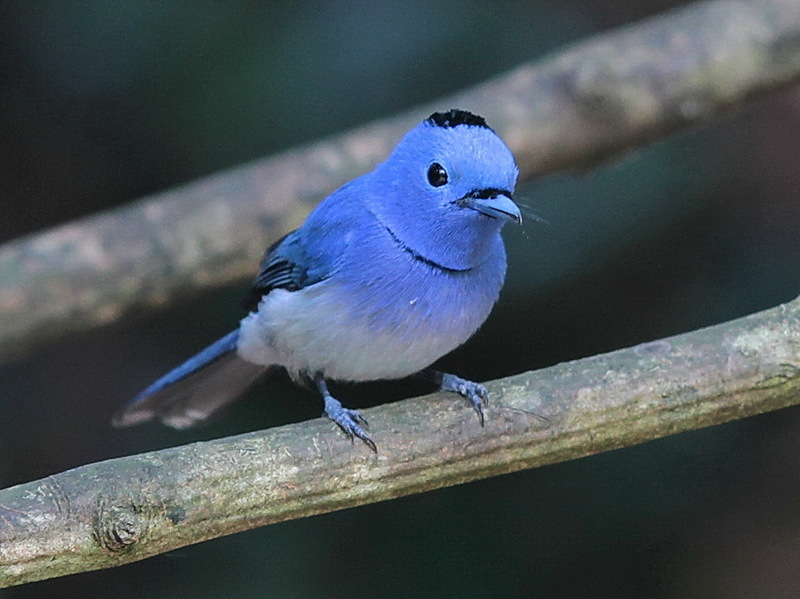 We wish to arrive at the lodge by 3 p.m. and get ready for afternoon birding before it’s getting dark. 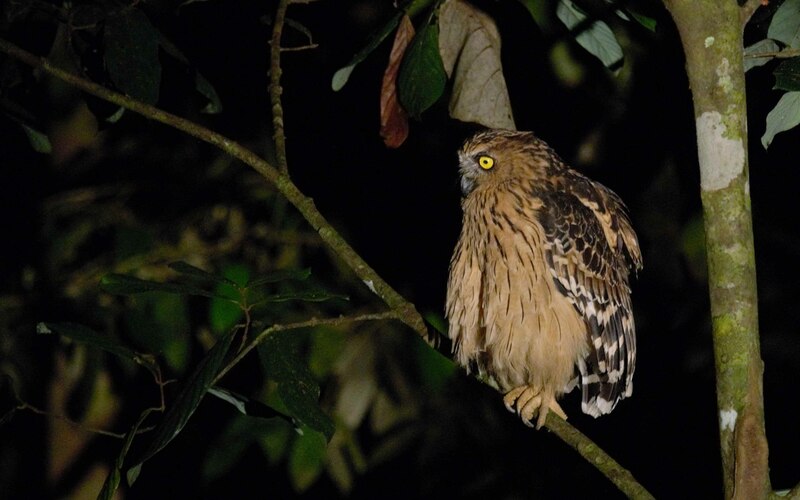 After dinner we may be able to join one of the night drives to look for nocturnal animal as well as night birds. 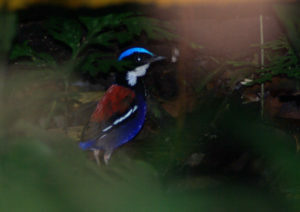 The entire slate of eight Bornean pittas occurs in Danum Valley. In addition to Black-crowned Pitta we particularly hope to find Blue-banded, Bornean Banded, and Blue-headed Pittas and of course also other special target birds like Bornean Blue Flycatcher, White-crowned Shama, Streaked and Black-throated Wren-Babblers, and Bornean Ground Babbler. 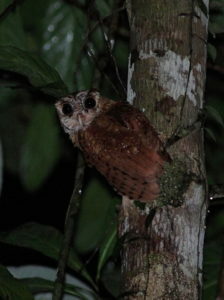 During our two days in Danum Valley we will explore the excellent system of trails around the lodge as well as the canopy walkway, and after dinner there will be opportunities to go out from the lodge with one of the local guides in search of nocturnal wildlife, either by truck or on foot. 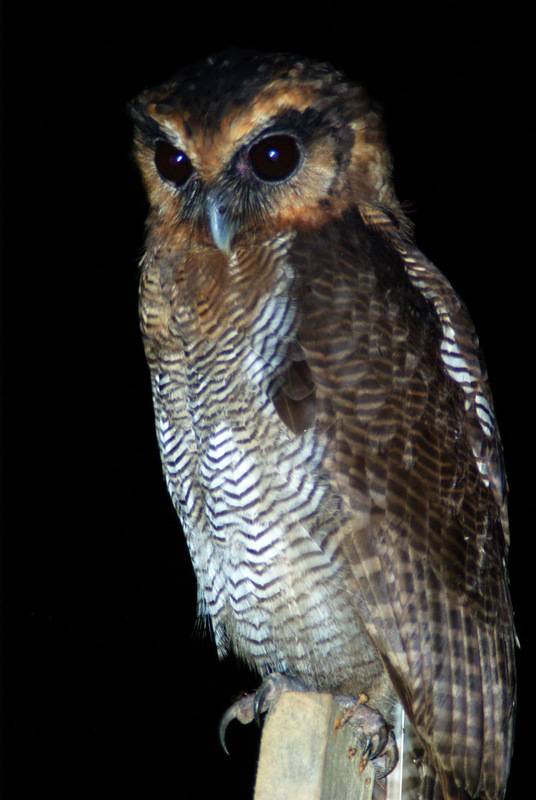 Results on night outings are always unpredictable, of course, but with luck we might find something really exciting, like Red Giant or Thomas’s Flying Squirrels, Colugo, the occasional Bornean Slow Loris or Horsfield’s Tarsier, the tiny Temminck’s Flying Squirrel, or the giant tree-dwelling Malaysian Tarantula. 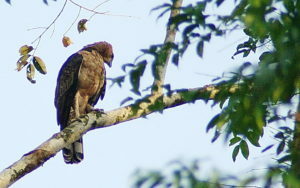 Danum Valley is a particularly good area for Bornean Orangutan, which is sometimes even seen within the lodge grounds. 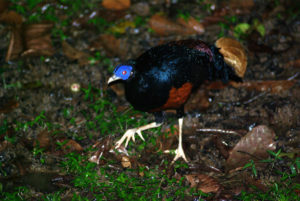 Commoner mammal species include Crab-eating and Southern Pig-tailed Macaques, a wide variety of both diurnal and nocturnal tree shrews and squirrels, Bearded Pig, Masked Palm and Malay Civets, both Greater and Lesser Oriental Chevrotains, the endemic Bornean Yellow Muntjac, the much-more-widespread Southern Red Muntjac, and Sambar. The biggest predator here is the Sunda Clouded Leopard, which is seen on night drives a couple of times a year – so one can always hope. Among the multitude of birds we hope to encounter here are eight species of hornbills, with the huge Rhinoceros Hornbill seen and heard almost daily. 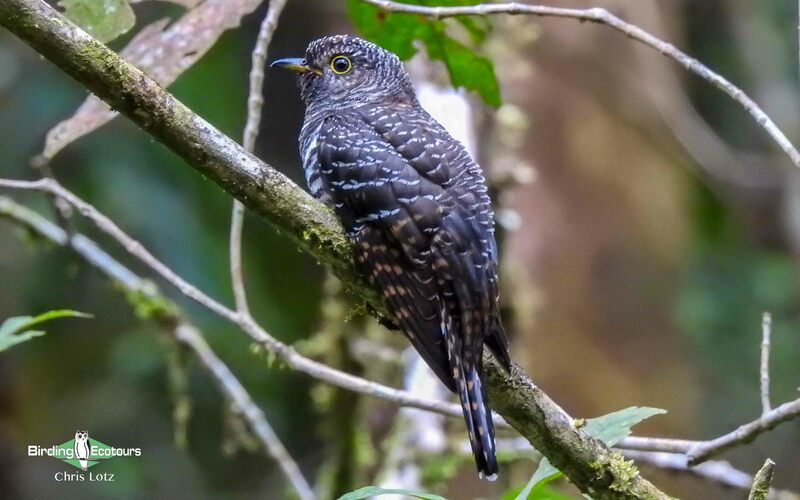 We’ll also be looking for many other specialties, like Great Argus, Crested Fireback, Black-crowned and Blue-headed Pittas (along with the other two more difficult endemic pittas), Bornean Bristlehead, Bornean and Black-throated Wren-Babblers, Sunda Blue and Bornean Blue Flycatchers, Chestnut-naped and White-crowned Forktails, Great-billed Heron, Wallace’s, Rufous-bellied, and Blyth’s Hawk-Eagles, Great Slaty and Olive-backed Woodpeckers, Ashy Tailorbird, Whiskered Treeswift, Oriental Dwarf Kingfisher, and a host of bulbuls, babblers, flowerpeckers, flycatchers, woodpeckers, drongos, raptors, sunbirds, and spiderhunters. The heat of the afternoon after lunch allows some relaxed meanderings around the resort, and you can find flowerpeckers and spiderhunters in the flowering bushes, along with some stunning butterflies. Sadly, our exciting tour to wild Sabah will end today. 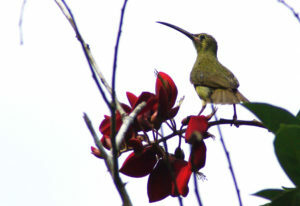 We will transfer from Danum Valley back to the Lahad Datu airport, where the tour ends. From here you will catch an afternoon flight to Kota Kinabalu to continue from there on your international flights home. 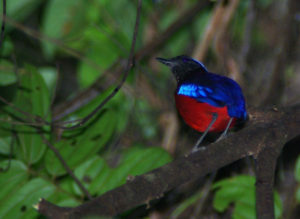 Please note that the itinerary cannot be guaranteed as it is only a rough guide and can be changed (usually slightly) due to factors such as availability of accommodation, updated information on the state of accommodation, roads, or birding sites, the discretion of the guides, and other factors.